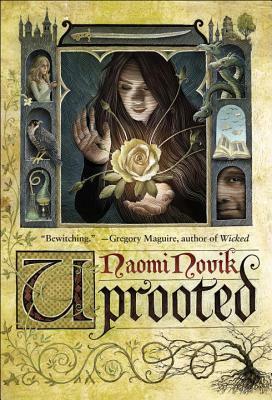 Review – UPROOTED is the kind of fantasy novel I couldn’t have read ten years ago. There is precious little “action” throughout the book, much of it reserved for the final confrontation between the Wood and our heroine’s group, and while I liked Agnieszka quite a lot there was little romance to be had throughout. 20 year old Lexie was an impatient sort of reader who liked her fantasy books filled with romance, action and political intrigue. UPROOTED, while managing to have all 3, is in fact about none of those things and Novik makes that pretty clear throughout. Novik and I crossed paths before, back when her first book HIS MAJESTY’S DRAGON came out. Dragons! Napoleon! War! All guaranteed to make me excited. But I fell out of love with it almost as quickly as I fell in love with it. Mainly because Novik writes at a much slower narrative then I have/had patience for. And before anyone says anything yes I love Brandon Sanderson and he writes slow narratives too, but there’s a difference that’s hard to put a finger to honestly. I can appreciate UPROOTED as a reader now however. The layered tapestry of the world coupled with the character relationships made for an intriguing, if not fast paced, read. Despite Agnieszka’s sometimes improbable leaps of logic and ability, her growth as a character is believable. How her relationship evolved with the Dragon, Kasia, and people she grew up with is part of the charm. I appreciated that Novik didn’t go for the easy route with Agnieska and Kasia’s friendship. Hard truths were told and examined, truths that any two friends of the same age sometimes have to face and its to their credit that it only made them stronger. This book is built on the back of their friendship–what each sacrificed and gained through their bond, as well as how it helped them shape their futures. The book did have a disjointed feel to it at times though. It follows Agnieska through being chosen, the early months of training, her reunion with Kasia, royal politics and lastly the truth at the heart of the battle of the Woods versus the Kingdom. Time progressed, but it was hard to follow just how much so at times it felt like Agnieska was making huge leaps in her magical training when in fact it had been months. The underlying plot, about the fight against the encroaching Woods, doesn’t even make sense until 4/5ths of the way in when some people’s past exploits come to light. Some of the best moments for me were when the Dragon would be in the company of his peers. Every single one of them seemed to be the crankiest personage ever, magnified when near him and often very amusing. There was so little to like about the Dragon though. He was rude, hateful, demeaning, petty, childish and rather selfish. I fully expect if Agnieska hadn’t found a way to being useful his sort of attitude change wouldn’t have happened. In the end this is a fantasy well worth reading. I’d suggest with several mugs of tea, while sitting outside on a nice (not horribly humid) summer day. Next YA BOOK DEALS: HARDCOVER PRE-ORDERS FOR ONLY $10 > OR LESS?! YES PLEASE!